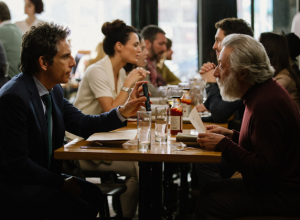 Noah Baumbach (Frances Ha) is on his way to becoming the new Woody Allen, which is a compliment. 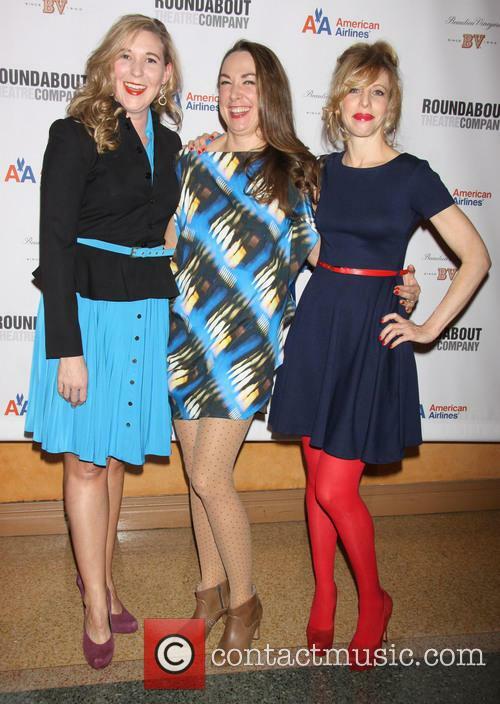 This film features an eclectic ensemble of A-listers coming together to play a hilariously neurotic Jewish New York family. The film is episodic and very entertaining as these people collide against each other. And their banter is wickedly funny, even when they're grappling with some very dark themes. It's also a rare chance to see Adam Sandler shine in a non-silly role. 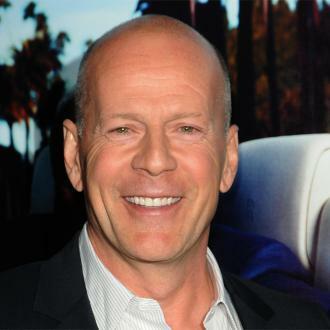 He's at the centre of the story as Danny, who has just split from his wife and moved back in with his cantankerous father Harold (Dustin Hoffman) and his loveably goofy fourth wife Maureen (Emma Thompson). 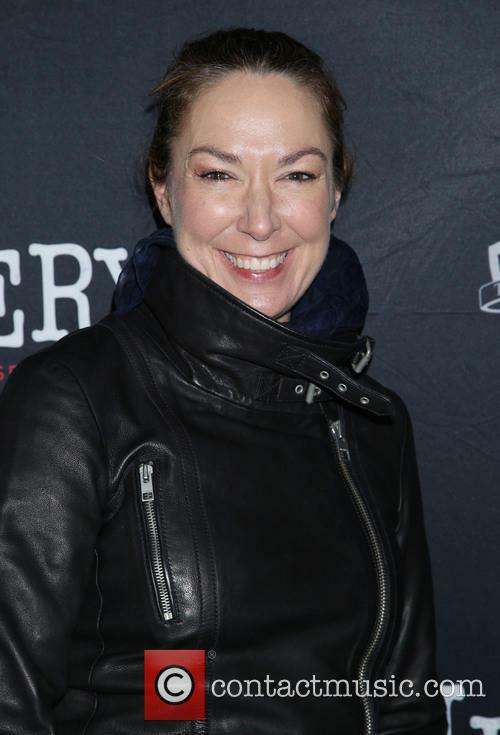 Everyone in this family has artistic tendencies, including Danny, his sister Jean (Elizabeth Marvel) and Danny's 18-year-old daughter Eliza (Grace Van Patten), who is heading off to university to study film. 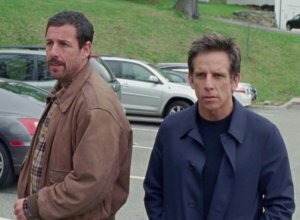 And then there's younger half-brother Matthew (Ben Stiller), who abandoned art to become a wealthy businessman in Los Angeles. Danny and Jean have always felt ignored in Matthew's presence, and this comes out into the open when they all gather to help take care of Harold when he ends up in hospital. Harold Meyerowitz (Dustin Hoffman) is a celebrated New York artist, whose quick-temper and filter-less conversation has left him estranged from his entire family. But when an event comes up celebrating his work at the Museum of Modern Art, they return to enjoy the experience with him. Of course, he's a particularly embarrassing person to spend time with, given that he's never short of opinions or afraid to speak his mind and thus ends up coming across as the rudest person in the room at any public event. 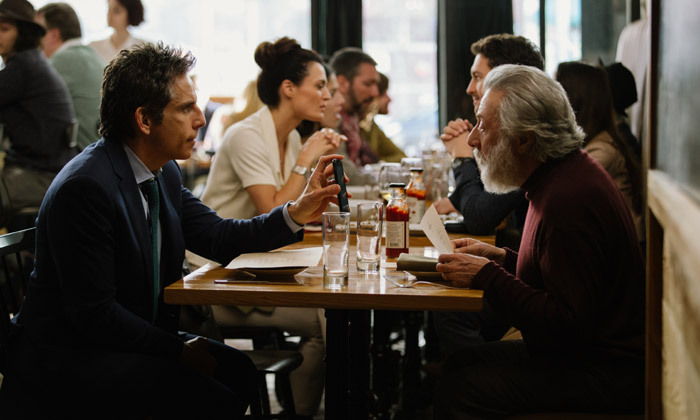 Matthew Meyerowitz (Ben Stiller) is his diplomatic son, who has actually had a piece of Harold's art named after him, but there is also his less successful son Danny (Adam Sandler) and his awkward daughter Jean (Elizabeth Marvel), and all of them want to make the most out of their rare time with their father and his alcohol-loving wife Maureen (Emma Thompson). It's particularly important for Danny to establish some kind of bond again, as his daughter Eliza (Grace Van Patten) is about to move away to college; he's proud, of course, because he was never able to get through college himself, but it's forcing him to release that the time he has left with his father is important. This is one of those films that dances right up to the edge of soapy sentimentality, making us a little nervous about where it might go. But director Marc Webb (500 Days of Summer) holds his nerve, letting the emotions build without ever tipping over into melodrama. What emerges is a striking exploration of the tricky connections between parents and children and the importance of makeshift families. And it's so sharply played that it can't help but move us. 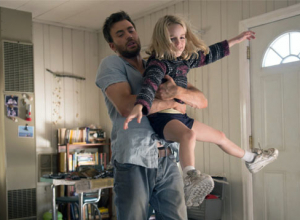 It's set in rural Florida, where the quietly intelligent Frank (Chris Evans) is hiding out from his academically minded mother Evelyn (Lindsay Duncan), trying to give his 6-year-old niece Mary (Mckenna Grace) the free-spirited childhood his late sister wanted for her. 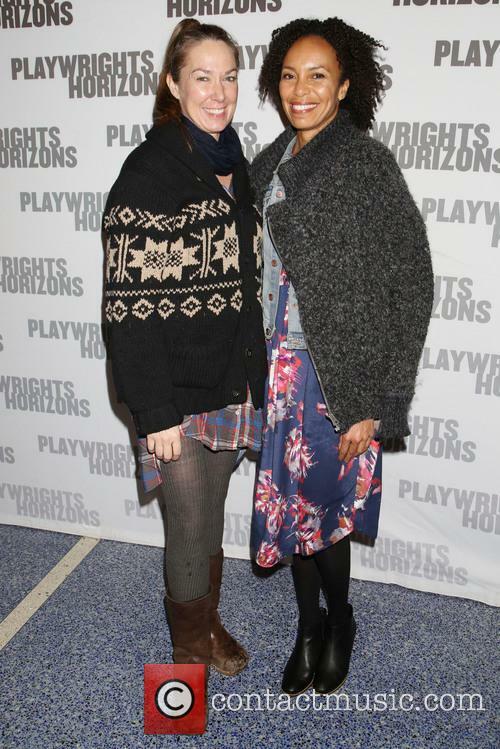 Their life includes sassy neighbour Roberta (Octavia Spencer) and a one-eyed cat named Fred. But Mary is a mathematical prodigy, and her teacher Bonnie (Jenny Slate) is worried that the public school can't keep up with her. This alerts Evelyn to Mary's gifts and, after taking no interest before, she sweeps in with a legal challenge to Frank's custody. Like her daughter and granddaughter, Evelyn is also a maths genius, and believes that Mary's abilities need to be exploited in a higher-class educational environment. 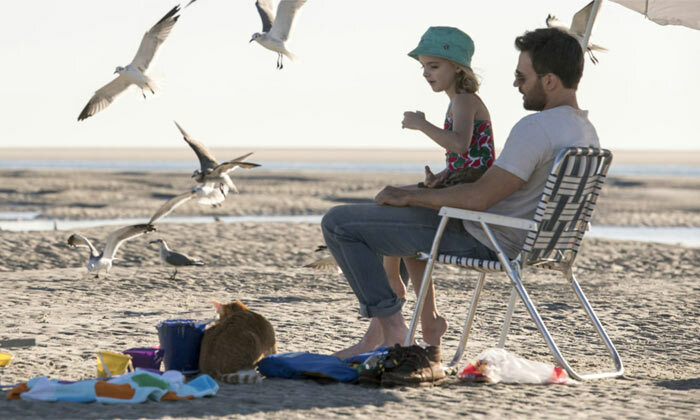 While the argument about what's better for this little girl is fairly simple, Tom Flynn's script never lapses into the usual trite courtroom drama. And while there are a lot of formulae scribbled on white boards, the focus is always on the people rather than the numbers. Thankfully, these characters also never turn into heroes or villains; each is just trying to do what they think is best. This means that the actors can invest unusual depth into the roles, adding surprisingly sharp edges while revealing their softer sides as well. Evans has rarely had a chance to flex like this as an actor, and he's terrific, creating some powerful chemistry with the, yes, gifted Grace. The breezy, entertaining tone of this historical comedy-drama kind of undermines the fact that it centres on one of the most pivotal moments in US-British history. Director Michell (Notting Hill) knows how to keep an audience engaged, and yet he indulges in both tawdry innuendo and silly cliches, never giving the real-life events a proper sense of perspective. Even so, some terrific performances make it enjoyable. The events in question take place in 1939, when President Franklin D. Roosevelt (Murray) invites Britain's King George VI and Queen Elizabeth (West and Colman) to visit Hyde Park, the upstate New York residence he shares with his mother (Wilson), while his wife Eleanor (Williams) lives down the road with her "she-male" friends. Roosevelt knows that George is here to ask for help against the growing threat of Hitler's Germany, and as a result of their talks a "special relationship" develops between America and Britain. Meanwhile, the womanising Roosevelt is not-so-quietly having an affair with his distant cousin and confidant Daisy (Linney). Essentially there are two films here fighting for our attention. Much of the story is seen through Daisy's eyes, complete with an annoyingly mousy voiceover that never tells us anything we can't see on screen. Linney underplays the character to the point where we barely notice that she's in the room, and the depiction of Daisy's romance with FDR is often squirm-inducing. By contrast, the other aspect of the plot is fascinating, with West and especially Colman shining in their roles as witty, nervous Brits trying to make the most of the first ever visit of a British monarch to America. Their steely resolve is brilliantly undermined by their brittle nerves and endless curiosity. 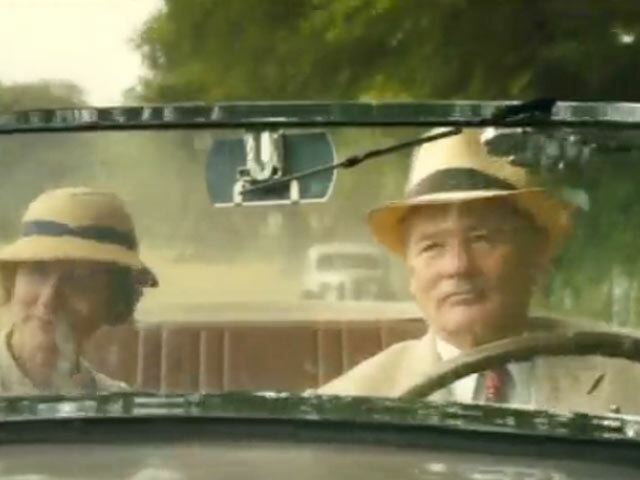 'Hyde Park On Hudson' is the story of the 32nd President of the United States Franklin Delano Roosevelt and his growing love affair with his soon to be mistress Daisy. In the summer of 1949, Roosevelt decides to invite the reigning monarchs of England King George VI and Queen Elizabeth over to America for their first ever trans-Atlantic trip - incidentally, the first trip to America any English monarch has ever made. The President's friends, colleagues and family rally together to create a fun and interesting weekend for the Royals despite their unfamiliarity with proper royal protocol such as knowing the proper way to address the King and Queen. Nonetheless, the royals remain polite and do their best to cover up their nervousness and lack of experience of American culture as war with Germany is imminent and they may need someone to turn to. This partially biographical and downright comical drama has been told in the shoes of Daisy and takes place only months before World War II broke out. 'Hyde Park on Hudson' has been directed by Roger Michell ('Notting Hill', 'Changing Lanes', 'Morning Glory') and written by Richard Nelson ('Ethan Frome') and is set to hit cinemas from February 1st 2013. 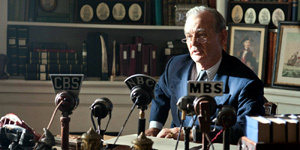 Starring:Bill Murray, Laura Linney, Olivia Colman, Elizabeth Marvel, Elizabeth Wilson, Eleanor Bron, Olivia Williams, Blake Ritson, Jonathan Brewer, Martin McDougall & Tim Beckmann. 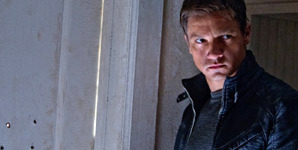 The CIA is confronted with the consequences of previous events that have taken place involving Jason Bourne. They decide that they must shut down Operation Outcome (the subsequent operation to Operation Treadstone) which will involve the assassination of Outcome agent Aaron Cross and Doctor Stephanie Snyder who helped produce the agents. They must find an escape or be killed. Inspired by true events, this darkly involving drug-ring drama holds our interest mainly because we have no idea what will happen to the central character, a smart nice guy played by Eisenberg with a huge dose of charming naivete. 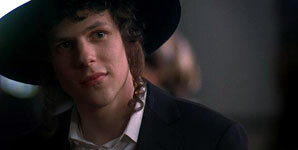 In the Hasidic community in 1998 Brooklyn, Sam (Eisenberg) is clearly struggling to find his place, working for his dad (Ivanir) and betrothed to be married. Then his neighbour Yosef (Bartha), older brother of his best friend Leon (Fuchs), suggests that he could do something on his own, make more money and get more women. So Sam and Leon head to Amsterdam, flying home with a case full of "medicine". When Sam objects, Yosef reminds him that the Jews have been smuggling for thousands of years. And of course the cash helps ease his conscience. True Grit is a 1968 Western book by author Charles Portis, Ethan & Joel Coen now lend the story and re-work it into a film adaptation. They are not the first directors to turn this book into a film as it was also attempted by Henry Hathaway in 1969 and starred John Wayne. Sam Gold is a good guy, he and his family live in a Jewish Orthodox community in Brooklyn and he's about to marry the woman his family have chosen for him whilst studying to become a Rabbi. His life path has already been set for him, but his neighbor Yosef senses Sam isn't totally happy with the direction his life is taking; he offers Sam a solution to his problems. Yosef introduces Sam to Jackie a man who needs certain 'medicine' transported from Europe to the US. Sam soon realizes that the medication he's transporting is actually Ecstasy pills, even though it's against his way of life, Sam accepts Jackie's offer.